on raising kids these days. and a free e-book. I find myself longing for the good old days, not that I ever lived in them, where I picture less toys, less media, less stimulants. I find myself this week wondering if I'm a part of the Sesame Street generation where it's been shown we can't hold our attention for more than a few moments, then what is Anderson growing up into? I find myself wanting to have less toys in front of him, to have him not see my attention always averted to the phone or TV. If there is music on, which there often is in our house, I want to turn it off when we read a book. I see him getting more and more active and wonder if he sees us so quickly dissatisfied with something if we don't get it right now, will he be the same way? My heart says..I bet so. Just some honest thoughts from a new mom. 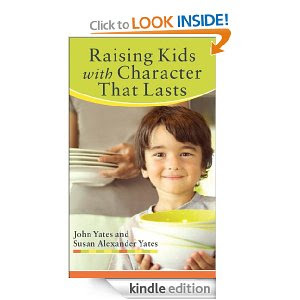 A new mom who has only read one book on parenting so far- Raising Kids with Character that Lasts. We read through it in the Mom's group I'm in and because I was always so far behind Benjamin and I read it at home. We also got it as a gift from our church when Anders was baptized. You know what? It's FREE in e-book form today! Amazon, Barnes and Noble and CBD all offering the FREE e-book deal! I'd recommend the book for a few reasons. First off, it's practical. Nothing in there was too lofty or made me think Benjamin and I were setting ourselves up to wish for a family structure that wasn't attainable. Secondly it's all about us. I'm a firm believer that when the parents are a unit they run the family, not the kids. A lot of the book talks about how our relationships and actions affect our kids so much- how we need to be in a right place to be setting a right tone for the house and raising our kids with the character we want! Third, it's short. I have to say it. This book won't take you years to go through. It won't sit on your nightstand forever, or in this case on your Kindle unread. As a parent time is precious and when you have some, read this. Today only the book is free in e-book form through Amazon, Barnes and Noble, and CBD. Click any of the links to download it today!